One of the valley’s few examples of roadside architecture, this business built to resemble a castle lies on Route 66 just over the border from Claremont’s restaurant shaped like a tugboat, both of them ’60s holdovers. Pomona’s began life in 1968 as Magic Towers, a King Arthur-themed burger palace for the kiddies, and later became Friar Tuck’s, a dive bar that might appeal to the dissolute grownups those kiddies became. I never ventured inside. 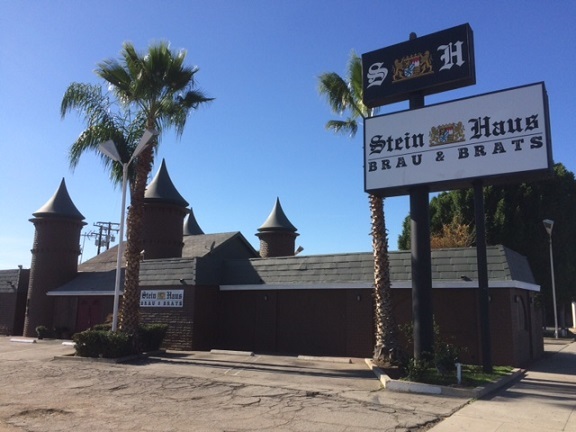 But now it’s been repainted, remodeled and rebranded as Stein Haus, a German-themed bar and restaurant with the aid of the reality-TV show “Bar Rescue.” German? Hey, there’s only so many things you can do with a castle. So for the first time, I went inside one recent afternoon. The dark brown paint outside may be an improvement over the faded gray from the English days. The menu is small and focused. They still have burgers, jalapeno poppers and other bar food, but they now have a handful of German items: pork schnitzel and bratwurst sandwiches, crispy spaetzle and pretzel bites, as well as a few specialty cocktails. 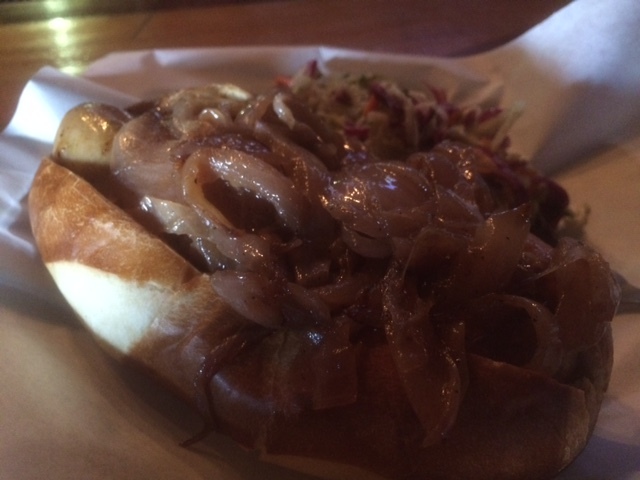 I sat at the bar, ordered a bratwurst ($10, pictured below) — after all, it’s in the restaurant’s sub-name — and hoped for the best. It took a while, but my brat arrived on a chewy pretzel bun, with spicy mustard (brown, I think, to match the prevailing color scheme) and grilled onions. A side of slaw was vinegary, with cabbage, green pepper and carrots. The whole thing was a pleasant surprise. Another day, I returned for dinner. It was early and the bar was quiet. I got the other sandwich, the pork schnitzel (also $10; pictured at bottom), which came with crispy spaetzle. 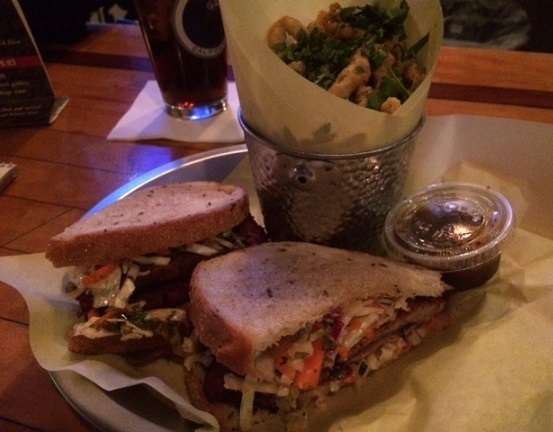 I liked the sandwich, which came on rye bread; the spaetzle was like doughy fries, without much taste. That said, I found myself eating it anyway. I wonder how long the reinvention will last or if the place will backslide, but the adventurous, and people who remember the old days, might get a kick out of stepping inside. 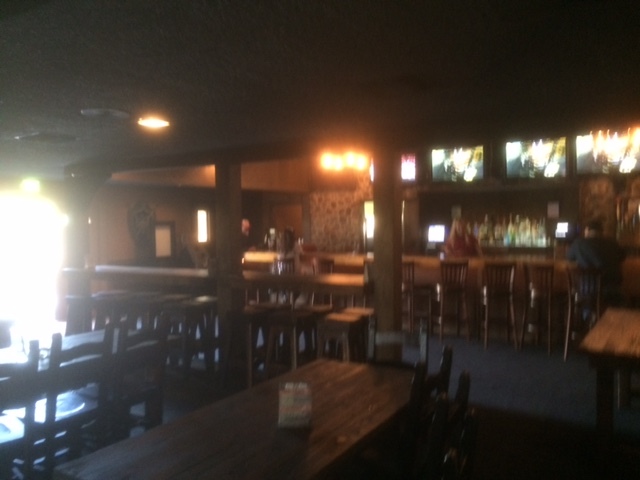 This entry was posted in Restaurants: Pomona and tagged bars, German, Pomona, restaurants by David Allen. Bookmark the permalink. Don’t forget, the place was “Kyoto Gardens” , a decent Japanese restaurant, for many years around the 1980’s or so. And in a castle, no less. Kyoto Gardens will be mentioned! You don’t sound hopeful. Running a restaurant must be the most difficult task ever. Ronald, you are so right but the Hi Brow takes the award for “real dive” as used to me mentioned in the I.E. Weekly…and the owner is proud of that title. Not too sure, though, about Kyoto Gardens…I thought it was a few buildings west but I’m not one to disagree with “NORM!”. Where’s Cliff when we need him? Hmmm. Seems sort of like polishing a terd.